MANILA -- Malacañang has hailed the decision of the Presidential Security Group (PSG) to place a bulletproof glass in front of President Rodrigo R. Duterte’s podium as a security measure during a Partido Demokratiko Pilipino – Lakas ng Bayan (PDP-Laban) campaign rally in Malabon City on Tuesday night. Presidential Spokesperson Salvador Panelo said whether reported threats are true or not, the President is bound by security protocols even though the President is unfazed by them. “Whether the threats are real or imagined, we take them seriously and the Palace commends the PSG for doing a good job,” Panelo said in a statement on Thursday. PSG commander, Brig. Gen. Jose Eriel Niembra, earlier said the PSG implemented the security protocol during the Malabon event because “the activity was situated in an open area” and “multi-faceted threats” were possible. He pointed out that even if the President wanted to have a close encounter with members of the audience, holding the highest position in the country automatically places him in a security bubble. “There is also no denying that President Rodrigo Roa Duterte is a man of the masses and has made himself accessible to the public, and will do so at every opportunity. The man could not care less about these threats,” Panelo said. “PRRD is, however, bound by security protocols and, whether he likes it or not, these protocols are mandatorily attached to the position he holds,” he added. “It is public knowledge that the Chief Executive has made many powerful enemies for spearheading this reform agenda in the two-and-a-half years of his presidency,” he said. Meanwhile, Panelo also expressed gratitude to Filipinos who are able to grasp the idea of prioritizing the President’s safety. “We also thank the overwhelming majority of Filipinos who understand the complexities involved in protecting the President's welfare and show genuine concern on the security of PRRD,” he said. 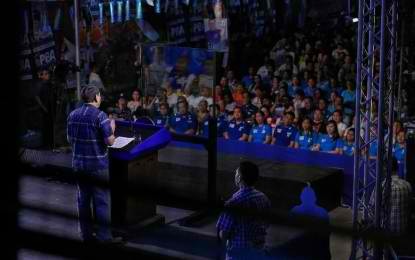 In his two-hour speech in Malabon City, Duterte said he had no control over the decision of the PSG to keep distance between him and the public. “Pagka-Presidente ko, iba ang istilo at gusto nila distansiya at hindi makadikit (My presidency has a different style. They want some distance [between me and the people]),” he said. The 74-year-old, however, said that everyone will die at some point, if it is already their time.